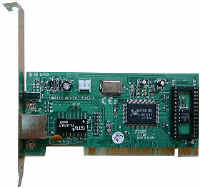 PCI Ethernet Adapter for 10BASE-T and 10BASE-2�G The family of network interface cards supports the popular PCI bus and PCMCIA Card bus architectures. Offering users the easiest way to set up a networking environment. In addition, a custom-designed Ethernet controller embedded in all the adapters connects you to Ethernet LANs using a high-performance data path. Easy Network Installation�G Using the drivers provided for Microsoft Windows 95/98/NT4.0 and Novell NetWare 4.11 network operating systems, you can optimize the adapter's configuration to match your machine. No other adapter is easier to install. L-970 offer Plug-and-Play functionality for hassle-free operation. 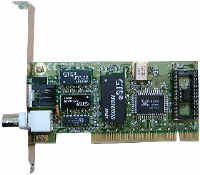 Standards Conformance�G ACORP L-970 Ethernet adapter can work with most popular networking operating systems. A socket is provided for an optional boot ROM for LAN Manager, LAN Server and NetWare RPL. Connecting to the network is easy. With automatic media detection and selection supported by L-970, you can use either an RJ-45 or BNC cabling interface to log onto a server. Superior Network Performance�G L-970 feature advanced technology that boosts data transmission speed, resulting in faster network performance and increased productivity.